...I got invited to look at the cool stuff Brookstone had added to their lineup of already cool stuff? Well, shortly after that they asked me if I would not mind reviewing the Koala HUG - Lumbar Support product. Ummm. YES PLEASE! I saw this item at the Brookstone on my visit and actually got to try it on there. I had been intrigued by the idea that this would strengthen my back. You see I have started lifting weights again - and doing Just Sweat on the Wii Just Dance 2 - and my back was not enjoying it so much. I have been in my share of car accidents with one resulting back surgery and many more injections. Ugh. Would the Koala HUG - Lumbar Support work? Would my back feel better? The answer after using this product for about a month is a resounding YES MA'AM! Wow - the difference it makes in just wearing for brief periods of time each day. My back feels so much better now. The tightness across my lower back was actually gone after just two weeks of wear. I wear it about 30 minutes each day now; and when I think I might need extra help. I really like what it does for my back. 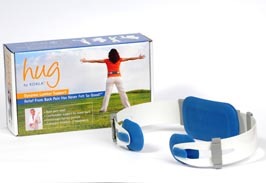 This review was done by me in exchange for my own personal Koala HUG Lumbar Support product. My opinion of the product is that you should definitely invest in it if you have low back pain like I do - or DID. This has really done the trick for me. p.s. I watched this video to help me use the HUG properly! I am all for anything that can help with back issues; something I never used to be concerned about.